The first century was an age of pluralism–every bit as much as this twenty-first century. How did the fledgling Church survive and, indeed, thrive in such a context of competing voices? How did they become “These men who have turned the world upside down” (Acts 17:6)? What can we learn from those who lived most closely with Jesus? Ramsey was not a preacher. He was a classical scholar and archeologist. He was reporting to us as a historian. He had no theological ax to grind; nor was he seeking a soapbox. He was not peddling ideology, but reporting the facts as they stood in that intensely pluralistic age. He penned his words in 1904, well before the cultural shifts of the 20th century which had such a profound influence with regard to a resurgence of pluralism in our nation. We have been considering how to live our lives on purpose, with intention, on mission with God. Last time we considered the first prong of this four-fold strategy—reaching our Jerusalem. 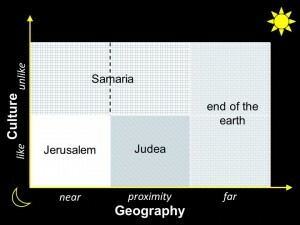 Your Jerusalem is made up of the people who are geographically near to you and culturally like you. Let’s now consider your Judea. Those in your Judea are still culturally like you, but they are different than those in your Jerusalem because they are geographically in proximity to you. The people in your Judea are “like” you in things such as income, neighborhoods, tastes, schools, work, ethnicity, language, hobbies, sports/reading/music/entertainment interests, etc. But they don’t’ live in your immediate circle of relationships or community, yet neither do they live at the ends of the earth. These people live within proximity of you; they are neither next to you nor far distant from you. They are people generally like you in terms of culture, but who are just beyond the circle of your immediate relationships. That might mean people who live one or two communities beyond the city where you reside. It might mean people in your company that you don’t regularly have any contact with. It might mean people in the same industry or career as you, but whom you don’t yet know. It might mean people involved in community groups or athletic teams like yours, but whose groups and teams are different from yours. It might mean people with the same hobby as you. Who might some of these people might be? Take a few minutes and ask God to help you identify people who are generally like you, but who you don’t yet know. Consciously (or better, in writing) identify several of those who make up your Judea. Now, what is one thing you can do to take a step toward those people? Just to begin to build relationship with them, to position yourself in their lives, to get to know them and to let them begin to know you? When will you take one of those steps? As you take that step, remember, when you are walking with Jesus into their lives. You might not share the gospel with them this week (or maybe you will! ), but you are moving toward the place where they will trust you enough to allow you to do so. As has been said, you are building relational bridges capable of bearing the weight of truth.